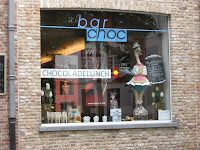 Europe Adventures: Goodbye Bruges.....Hello Paris!! 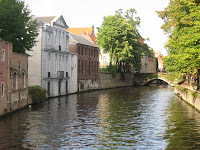 We awoke in Bruges after the worst nights sleep either of us have had in probably months, not by our own doing this time. Our crazy german roommate and 3 Japanese roommates made for quite the evening. We had good intentions of going to bed at 10, but were kept awake by the German snoring loud enough to wake the dead and talking to himself, and the Japanese boys coming back very late, very intoxicated. One of the japanese guys even yelled out in his sleep once, "i'm drunking!" At one point one of them had the hiccups for well over an hour, he also being the one who immediately threw up breakfast and went back to bed. Lovely. After showering and checking our luggage for the morning, we went off to find breakfast and to see a few sites we had yet to see. 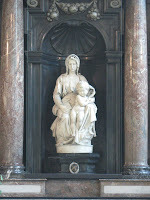 First stop was the madonna and child statue by Michalenglo, which is one of the few works done by him on display outside of Italy. Its kept in a beautiful church that recieved it as a donation in the 1800's. Next on the agenda was breakfast. 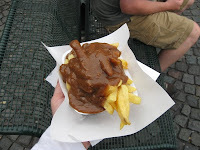 We tried the 2nd of the competing "frites" stands, this time with meat sauce on them. It was more of a delicious savory beef gravey, and really went well with the fries. Next stop was the supermarket for snacks for the train to Paris, which consisted of ketchup flavor chips, chocolate covered waffles, a bar of belgian chocolate, and a giant bottle of fanta, all for the low price of 5.95!! On the way back to the hostel to get the bags Heather wanted to stop off and get some hot chocolate at a chocolate bar that had 44 flavors of the drink. She decided on a cinnamon flavor that came in a tall glass, with little sides of sugar, cool water, and the best whipped cream either of us had ever had. We wondered if we could order just a large glass of the cream. The hot chocolate would form a skim type crust over it if you let it sit for a moment, yum!! After collecting our belongings it was off to the train station to catch our ride to Paris. The train first brought us the hour back to Brussels, then switched trains to a high speed train to Paris, which would take a bit over an hour. When they say high speed, they mean it! We passed some time playing cards, poker this time, and enjoying our snacks. The French ticket clerk noticed our passports were from the US and asked us where we were from. When we replied St. Paul, he told us he had relatives that live in Wisconsin about 3 hours from the cities and that he was traveling there in about 2 months for deer hunting. Small world. Our train dropped us off at Paris Nord station, which turned out to be in a bit of a sketchy part of town, as witnessed by the police and armed soldiers having roped off most of the station and not letting anyone in for a period of time, which we never did learn why. We attempted to find a subway to our hostel but were offered no help by the woman behind the counter, so we took a cab instead. Our room was on the 5th floor, which in Europe means the 6th, and of course no lift, so up the stairs we went then up a spiral stairs. In our room we discovered we had a loft, so we took that, up the ladder we went. So we are officially on the 7 1/2 floor on the 5th floor if that makes sense. After a quick clean up we wandered out to make the most of our first night in Paris. We walked about 3 blocks and came upon a very large building and questioned what it was. 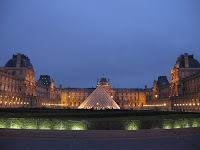 Walking around the side of it, it grew larger and noticed that it was the Louvre museum. We wandered into a large square that is completely undescribible how large it was and stood in awe. Looking through a gate we could see the famed glass pyramid, so we walked towards it. Walking around the Louvre we caught our first glimpse of the Eiffel tower, and got that same good feeling we got in London upon first seeing the bridge. The sun was just setting so it was just starting to light up blue for the night, it was a beautiful sight to see. Walking up to the glass pyramid was a jaw-dropping experience. It was a beautiful night out, the sun was just setting, and the glowing light off the glass and fountains was incredibly inspiring. Up ahead we saw the arch de triumph in the distance so we decided to walk towards it. It didnt look more than maybe a mile away trying to judge its size with the monuments near us, but as we got walking it became another story. 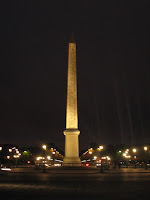 One of the monuments we walked by was an Egyptian Obylisk that is 3200 years old and was given as a gift to France. Easily the oldest object either of has ever seen. 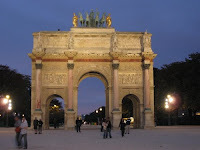 It was located at the site of the infamous guillotine that beheaded so many aristocrats. We walked up the champs elysee (Heather thinks this is the most beautiful word in the world) for at least an hour, wondering if we'd ever reach it. It was long and tiring but how could we complain? 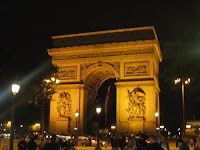 We were in Paris on an absolutely perfect night, walking up one of the most famous streets in the world. It was lined with any high end fashion name you could imagine, countless restaurants, and of course the disney store we checked out real quick to see the Wall-E stuff. The arch ended up being about 5 times larger than we thought from the distance, a very cool site to see, and one of the most famous landmarks in Paris. Everything we saw the first night blew us away, the city is simply stunning and impossible to put into words all the beauty here. To say Paris citizens are proud of their city is an understatement, and they have every right to be. On the long walk back, we stopped at a little cafe next to the Louvre to rest our feet and grab a quick bite to eat. Charlie ordered a salmon baguette while Heather got a cheese crepe. Like everything we've had in Europe, it was amazingly fresh, and the cheese in the crepe was unlike anything we'd ever had. So rich and creamy, we wondered what kind of cheese it was, figuring it was one that we'd never had nor heard of. Quizzing the waiter about it, it turns out it was Swiss cheese!! We figure there must be some magical Swiss cheese in Switzerland we'll have to look for. We walked back to the hostel, up "5" flights of torturous stairs, and climbed the ladder up to our beds, thankful for quiet roommates and being able to rest our tired feet for the night. Interlaken, Switzerland - Yo Da Lay He Hoo! Paris - Last Day on to..... ??!?!?!?! ?